Digital UltraViolet and Digital Copy will makes it possible for you to stream the movie Green Book HD UV or iTunes Code instantly to your computer and compatible Smartphones, Andriod, iphone, iPod Touch, iPad and tablets devices anytime, anywhere. You can also download a Digital UltraViolet Copy or a Digital Copy of the movie Green Book HD UV or iTunes Code to your computer and compatible devices. Academy Award nominee Viggo Mortensen and Academy Award winner Mahershala Ali star in Green Book, a film inspired by a true friendship that transcended race, class, and the 1962 Mason-Dixon line. 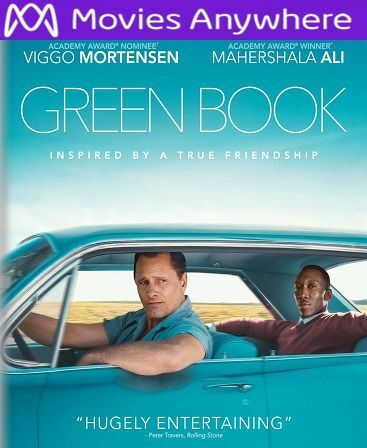 When Tony Lip (Mortensen), a bouncer from an Italian-American neighborhood in the Bronx, is hired to drive Dr. Don Shirley (Ali), a world-class Black pianist, on a concert tour from Manhattan to the Deep South, they must rely on "The Green Book" to guide them to the few establishments that were then safe for African-Americans. Confronted with racism, danger as well as unexpected humanity and humor�they are forced to set aside differences to survive and thrive on the journey of a lifetime.